Get your vote on and glow with this artful call to action. 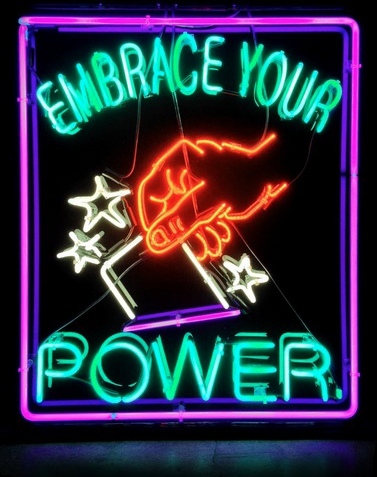 “Embrace Your Power is a neon artwork created and then positioned and documented around Los Angeles. This is no regular message used in politics to get people to vote. It also shows the beauty of Los Angeles’ ‘sleeping giant’ communities. See the photos around LA and 2 of the 12 videos featuring the neon art sign below, one featuring Season 12 American Idol winner Candice Glover. The art and photo essay are designed to support “Embrace Your Power”, a student-led effort to get more young people to affect social change through political engagement sponsored by SEIU California. Produced by LA-based Big Bowl of Ideas, it was a collaboration with Los Angeles artist Patrick Martinez and fashion photographer Colin Young-Wolff on behalf of a group of non-profit, community-based organizations. “To get people to vote — especially young people — it was really clear that it needed a dynamic visual presence. Something that was non-traditional in terms of normal political communications,” said one of the organizers. A twist on the neon Palm Reader signs we often see somewhere, the is a subtle, streetwise message behind it is “Make your own future, by voting.” The work was then placed in locations against places that represented either the diverse communities of LA or the issues impacting them – like clinics and schools and libraries — that require their political engagement in order to thrive. Its like the sign is talking to the people. Wanna vote? Don’t know where? Click here for the #GoVote website and find your polling place.